Who are we: African Americans, Native Americans, Irish Americans, Jews, Christians, Muslims? Using pattern as metaphor, my work explores cultural, social, and personal identity in the digital age. Initially, I appropriate image patterns from a variety of sources then reduce them via technology to a simple line drawing. Next, I overlay several images in order to disrupt the individual patterns and suggest one all-embracing identity. As a painter, I value the primacy of color in my work. Because color suggests an inner energy, enhances ties to identity, and strengthens cultural bonds, the combined effect of line and color results in a portrait of the world around us where everything is happening at once. I work in a variety of disciplines and media. My drawings on paper are the line structures of the layering of the patterns. On the paintings, I add color to each new shape created by the overlapping patterns to intensify the visual composition. My steel sculptures are produced by taking the shapes from the drawings and paintings and relating them back to one another in three dimensions. When constructing an interactive drawing installation, I start with a template, computer-generated image, or common shape(s) then allow the space and/or architecture to dictate the direction of the piece. Once I have finished the initial form, I invite the audience to participate by giving them limited instructions. The installation then becomes a collaboration suggesting a new type of identity or DNA borne by the group. 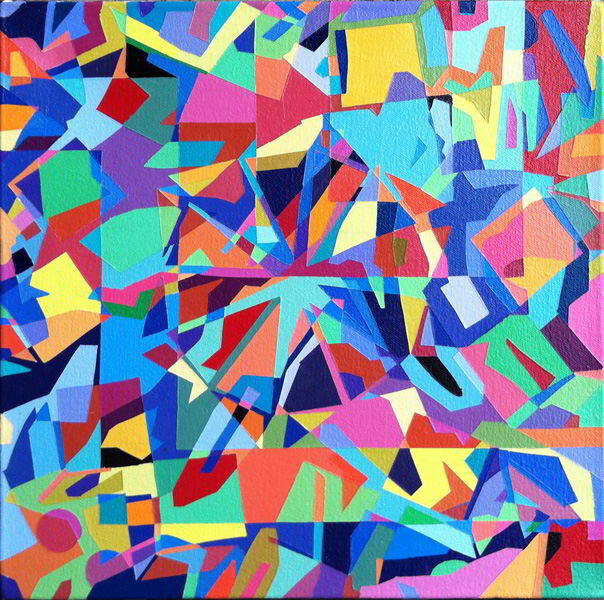 Math, 2013, acrylic on canvas, 12 x 12 in.